Travelers are using technology to upgrade their trips at every turn. This includes checking in for your flight on your phone, surfing the internet while flying across the country and requesting a ride with a ridesharing app once you land. So it's no surprise that technology is creating more opportunities for airlines as planes become more efficient. Aircraft manufacturers are building in more options for travelers and for airlines. A few new planes are showing up here in Anchorage. Last month, United flew a 737 MAX 9 between Houston and Anchorage. Nonstop. Last year, United operated a 757 on the 3,266-mile route. But the 737 is more efficient, which is why United ordered 100 of the planes. If you want more than 30 inches of pitch between the seats, you'll have to pay more for United's "Economy Plus" or first class. By comparison, both Alaska and Delta offer at least 31 inches of pitch between Anchorage and Seattle. Between Anchorage and Seattle, the 737-800 is the real workhorse. Earlier this month we flew on a new 737-800 with Alaska Airlines. It still had the new plane smell. The overhead bins were huge. There was mood lighting. We sat in the "premium" section, so there was an extra 4 inches of legroom (about 36 inches of pitch). There were USB power outlets at every seat. It was a nice flight. Because of the technological options, every airline has its own spin on how to configure the plane. Delta has a heavier seat so it can add a seat-back TV. Alaska still is offering its stand-alone tablet for travelers to watch movies. Both airlines offer their streaming library if you want to watch movies on your own phone or tablet. Alaska and Delta also offer in-flight internet. Delta offers the faster "2ku" service. I paid about $20 one-way from Seattle to Anchorage just to check it out. It offered much faster connections than Alaska's option, although Alaska also is upgrading to the faster service. Sun Country Airlines also flies the 737-800 to both Seattle and Minneapolis. I haven't flown the plane, but the seating chart says it's the same pitch as Delta and United: 31 inches. This is important to me, since I'm 6 feet, 4 inches tall. Although Sun Country rents tablets so travelers can watch movies, it doesn't offer in-flight internet. For Alaskans traveling nonstop from Anchorage to Seattle or Portland in the summer, JetBlue has the most legroom: 33-34 inches of pitch. But because of JetBlue's satellite service, the TVs only have a few movies and the internet doesn't work north of Seattle. Once you get to Seattle, though, things get more interesting. For example, JetBlue has taken several A321s (a "stretch" version of the A320) and added a premium cabin called "MINT." It's not available on every flight, but you can fly Seattle-New York or Seattle-Boston in a lie-flat bed. It's not just the bed, either. The menu features dishes from Saxon + Parole in New York, some fancy wines and cocktails. For your cross-country nap, there's a big down comforter and a fluffy pillow. To compete with this premium service, Delta re-introduced its lie-flat "Delta One" service on specially-outfitted 757s between Seattle and New York/JFK. The closest I've gotten to those seats is about five rows back on my last flight to Hong Kong. But the people looked so happy and relaxed after their long nap. One extra for Delta customers: access to Delta's SkyClub before the flight. This is the nicest lounge at Sea-Tac. 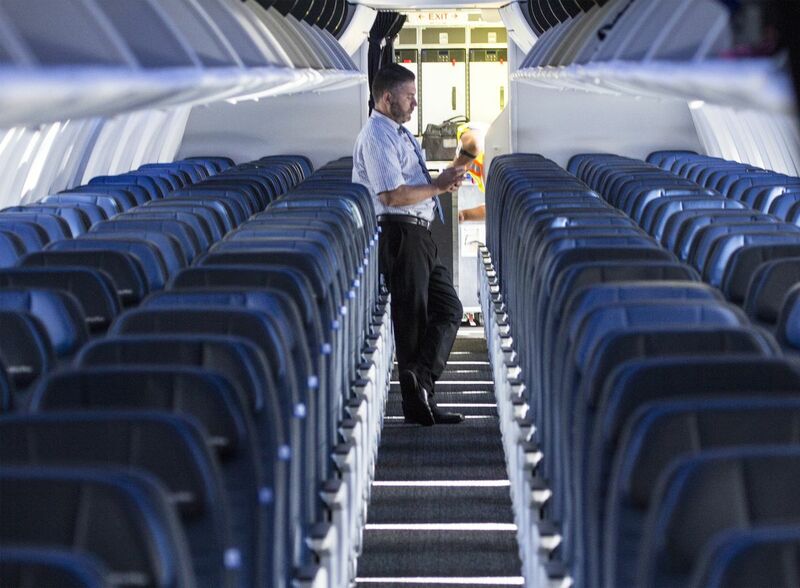 When JetBlue configured the A321s for MINT, they also upgraded the rest of the cabin. There are bigger screens and fancier seats. The cabin crew said all of the A320 interiors will be upgraded. And on the east-west routes, the DirecTV and internet worked! Delta and JetBlue both have ordered new Airbus A220s, which were engineered by Bombardier from the ground up. They offer wider seats in a two by three configuration, a quieter ride and bigger windows. From Seattle, travelers have access to some beautiful new planes. The Boeing 787 Dreamliner is operated by Virgin Atlantic, Norwegian and Xiamin Airways, among others. If you book a Delta trip from Anchorage to London, the Seattle-London/Heathrow leg may be operated by Virgin Atlantic. I was impressed flying on Norwegian's 787 between Oakland and London. I was in the cheapest of the cheap seats, yet I had about 32 inches of pitch. There was plenty of headroom—I could barely touch the ceiling in the cabin. The windows were much bigger and the ride was quieter. Delta is dropping its Seattle-Hong Kong nonstop in October. Starting April 1, 2019, Cathay Pacific, an Alaska Air mileage partner, will start running a four-times-weekly nonstop to its hub in Hong Kong. The airline will operate the high-tech Airbus A350 on the route. Philippe Lacamp is senior vice president for the Americas with Cathay Pacific. He specifically credits the A350 for making Seattle-Hong Kong a viable route. "Seattle's been on our radar for decades," he said. "Cathay Pacific is a high end premium carrier, so the business market is very important to us. But the A350 allows us to offer competitive fares." Like the 787, the A350 is a wide-body aircraft designed to trim fuel costs and use the latest technology to improve the travel experience. Some frequent travelers prefer the A350 over the 787. Ben Schlappig writes the "One Mile at a Time" travel blog. He says the A350 is quieter, is more comfortable and has better windows. I'm still smitten with the 787. But when I had the chance to fly an A350 from Johannesburg to Singapore (Singapore Air), I opted to travel on Emirates through Dubai to get more Alaska Air miles. Watch for more new planes, such as the Embraer E175, to fly more routes in Alaska. Although it's smaller, there are no middle seats! Technology really does matter when it comes to passenger comfort. With new planes, travelers have more options to make their trip more comfortable.